For the year 2015, Remembering Marco has partnered with The Young Executives Committee (YEX) of the Italy-America Chamber of Commerce in New York City. The total raised during this year’s fundraising campaign is about $7,500. All the proceedings have been donated to Weill Cornell Medical College -Genitourinary Research Fund on Tuesday, April 7th 2015. Dr. Ana Molina received the check and will be using it for her trials to support Kidney Cancer Research. You can find all the details right here: Remembering Marco_Cornell. We are proud of having achieved such an important goal and will continue to do so in memory of Marco. Thanks to all of you for your kind and generous contributions. Grazie. Un grazie speciale a tutti coloro i quali hanno partecipato alla Raccolta Fondi per la ricerca sul Cancro al Rene dedicata a Marco il 16 dicembre 2014, a New York City. Con piu’di 150 partecipanti, la serata e’ stata un verso successo. Un’altra dimostrazione di quante belle amicizie Marco abbia costruito nel corso dei suoi anni a New York. La Raccolta Fondi ha dato a tutti la possibilita’ di conoscere meglio Marco, la sua storia, ed il suo modo di essere cosi’ speciale. Grazie in particolare alla Dott.ssa Ana Molina dell’ospedale Weill Cornell di New York per aver partecipato alla serata, per aver ricordato Marco, e per averci insegnato qualcosa in piu’ sul cancro e sull’importante ruolo della ricerca. Grazie anche a tutti gli Sponsor che hanno donato un prodotto per l’asta benefica, tra i quali: Valentino, Bucellati, Crowe, Isaia, Eidos, Silvia Torrini. Infine, un grazie a Paolo, Maura e a tutto lo staff di Revel. 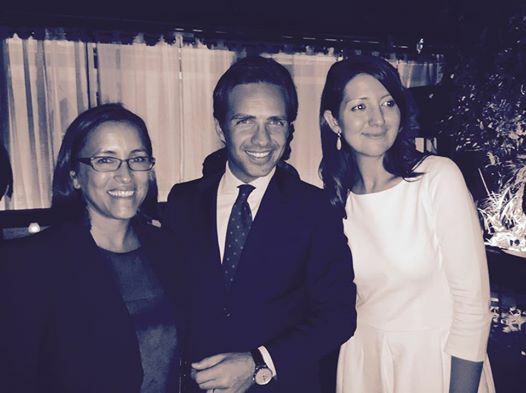 Annalisa with Dr. Ana Molina of Weill Cornell, receiver of the funds collected at the Fundraiser, and Giancarlo Perlini, President of YEX – Young Executives Committee. Thanks to the Young Executives of the Italian Chamber of Commerce for giving me the opportunity to speak about Marco and tell a little bit of his story this evening. I’m going to try to be brief, as I’m sure Dr. Molina has a lot of important things to say to each of us. I do want to tell you something about Marco though because he was a very special person and this is exactly what he deserves. Please listen carefully, because the story that I am about to tell is a story that could be about any one of us here tonight. It was April of 2012. Marco and I had been married for two years. He was working for Italian Fashion Company Valentino as the Director of Finance, a job and a company that he really loved. I was about to make a career change from finance to real estate. We had just purchased our beautiful apartment in NYC. We had just gotten our Green Cards, and you all know how big this is for expats like us. At the time our biggest challenges and choices were: deciding how to advance in our careers, where to go on vacation for the summer, what new restaurant to try, and how to decorate our home. We basically didn’t have any problems. Oh yes, I should mention something else. We were trying to have a baby. This is how we discover IT. IT would be cancer. Marco went for a routine check-up and the doctor suggested that he get an X-Ray. During the exam the technician called the doctor in. I think that Marco knew immediately that something wasn’t right. Shortly after that, we met Dr. Molina and her staff. Unfortunately the diagnosis was not a favorable one. Kidney cancer, stage 4. If you don’t know what that means, I will tell you that the scale goes from 1 to 4, where 4 is the worst. Despite our good intentions, we were not prepared for what would come. The first year was ok. Marco was still doing pretty well, working pretty much full time, we were travelling, and we were enjoying life. I can’t say the same for the last 6 month before Marco passed away. He had lost a lot of weigh and he just wasn’t the same. He did look the same to me though because I was –and I am- in love with him and I wasn’t really fully able to see what was going on. For me, WE were going to make it simply because we loved each other, because we were kind, gentle people and we did not deserve this. Well, I guess life had other plans for us. Life isn’t fair by any definition and Marco and I have surely learned that the hard way. Marco used to say “la vita ti da e ti toglie”, life gives you things, and then takes them away from you. Now, I don’t want to end this recollection of Marco with sadness, because if you knew Marco you would know that he was always positive, always serene, and making fun of people in his unique, loving way. So, I will tell you this. It was my 30th birthday the day before Marco passed away on November 15th 2013. That evening of my birthday, the night before I lost my husband, Marco had organized a surprise birthday party for me with all our friends and family. I remember that I dressed up for him; I wore the dress that he had bought for me, the ring that we picked together, and his favorite perfume. I like to think that this wasn’t really a party for me, but rather his way of saying goodbye to everyone. That night we were very happy. So, tonight, when you go home, hug your husband, wife, girlfriend or boyfriend and do not take the hug, the love, for granted. Be very grateful for it. This is what I do every day, I’m so grateful for the little time I had with Marco, because it was just perfect. And now let’s talk about Remembering Marco. I started working on this initiative shortly after Marco passed away. It was a way for me to keep my head busy and to have something to focus on. Remembering Marco is an initiative that helps collect donations and annually distribute to charities in Italy and in the US. Last year a scholarship was created in Marco’s name at the University of Bologna. This year we have partnered with YEX, and all the funds collected will be donated to Cornell Hospital for kidney cancer research. Thank you all for giving me the opportunity to speak about Marco and hopefully you know Marco a little better than before. As I introduce Dr. Molina, I just want to take this opportunity to thank Dr. Molina and her staff for their tremendous care of Marco throughout his illness and helping him live life to the fullest. In 2014 Remembering Marco funded the creation of a Scholarship in name of Mr. Marco Omiccioli at CIRC, the Interdepartmental Center for the Cancer Research Giorgio Prodi of the University of Bologna – Sant’Orsola Malpidi Hospital. The total raised in the year 2014 is about $30,000. For the year 2015, Remembering Marco has partnered with The Young Executives Committee (YEX) of the Italy-America Chamber of Commerce in New York City. 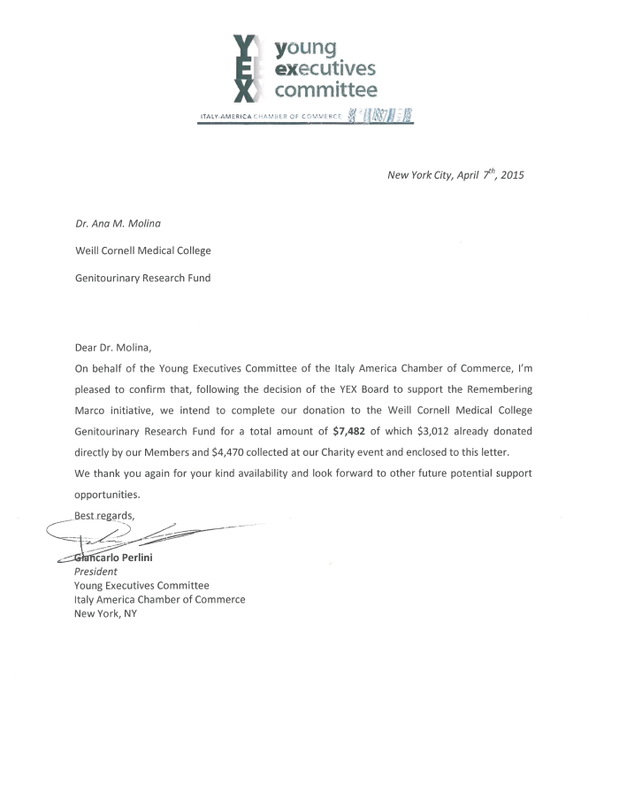 All the proceedings collected by YEX’s will be donated to Weill Cornell Medical College -Genitourinary Research Fund, to support Kidney Cancer Research.